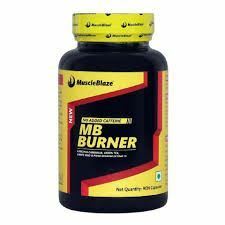 MuscleBlaze MB Burner With Garcinia Cambogia, Green Tea, Grape Seed & Piper Nigrum Extract Capsule comes with a perfect blend of Grapefruit and Green Tea in concentrated forms. Consuming these ingredients can help you burn your fat and achieve a trim and toned body. It helps to lose weight in a natural way. It helps to provide you more energy for your intense workout sessions and helps to reduce fat naturally. It makes you feel full and satiated for a longer duration of time, thus helping you to consume fewer calories. It helps to enhance your body's metabolism. It helps to stimulate your body's metabolism. It helps in keeping you full for a longer span of time, helping in lowering craving for unhealthy food. MuscleBlaze MB Burner helps to enhance fat burn rate naturally. Take one capsule twice daily or as directed by the physician.